If it weren’t for the superior quality of Swiss ice axes and other mountain climbing equipment, REI’s 11,000+ employees may have never found nirvana in a company that has been ranked in Fortune magazine’s “100 Best Companies to Work For” since 1998. Back in the 1930s, mountaineer Lloyd Anderson’s quest for an ice ax, one that was of top quality but didn’t break the bank, looked hopeless. After a lengthy search, he finally found what he was looking for in an Austrian alpine catalog, a Swiss ax for $3.50, including shipping. Learning of his great deal, others in the climbing community wanted in on the action too, and before long, Lloyd, his wife and 21 fellow climbers joined forces to create the first outdoor gear co-op in 1938. Like the axes, the inspiration for REI came from overseas. While researching models for the business, Lloyd happened upon the Rochdale Equitable Partners Society, the originator of the modern cooperative movements. Some of the hallmarks of REI – open membership, equal votes, one-time membership fees and a rebate on purchases – were inspired by the Rochdale model. REI didn’t rise right to the top. For its first six years, the company was run out of Lloyd’s West Seattle shop until there was so much demand for the product that the cooperative opened its first store. By today’s standards, three shelves in the back of a downtown Seattle gas station isn’t exactly something to write home about. But for the fledgling co-op, it was a start. 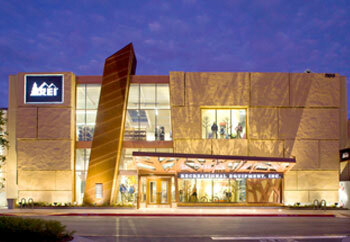 It was nine more years before REI hired its first full-time employee to run the store. Sales were at $72,000 by now and two brothers by the name of Whittaker took over the operation of the co-op. If the name is familiar, perhaps you heard of Jim Whittaker who was the first American to reach the summit of Mt. Everest. It was Jim and his twin brother Lou who shepherded REI into the retailing giant it would become. The Whittakers expanded the company, creating a product testing subsidiary and opening additional stores in Oregon and California to join their flagship Seattle store, which had moved out of the gas station. Though Whittaker eventually left due to a disagreement about the direction the company was going, REI continued to follow his lead, entering a period of unparalleled growth and expansion, including branching into new lines of equipment, apparel, and even gourmet popcorn. Though REI has grown to more than 125 stores in 31 states employing more than 11,000, it made a major commitment to its birthplace when it broke ground on its Seattle flagship store in 1996. The 100,000 square foot store has more than twice the space of the old store on Capitol Hill, including 21,000 square feet set aside for native plants and flowers, a pond, an outdoor trail for testing mountain bikes before they are purchased, a Rain Room to test waterproof clothing and a glass enclosed 65-foot rock wall with views of downtown, the Olympic Mountains and Puget Sound. Today, REI is the largest consumer co-op in the country, with 3.5 million active members and customers, providing expert advice and trusted products to weekend warriors and experienced outdoorsmen who challenge themselves and the elements in REI gear. As a custodian of the environment and the marketplace, the company gives back to its community through volunteer projects involving money, equipment and “beads of sweat” to outdoor-focused community organizations. It is a retailing and stewardship model that Lloyd Anderson would have been proud to be part of. Washington State certainly is.